It may not seem like it at first glance, but being an office worker puts a tremendous strain on your body. Your muscles, especially your hamstrings, tighten from sitting all day. You start to get tension headaches thanks to being hunched over your keyboard. Your eyes get strained looking at monitors… You get the picture. Additionally, office workers go through varying amounts of mental stress. As you climb the corporate ladder, the amount of stress increases. At the same time, the number of hours worked seems to also go up, cutting into your R&R time. Yoga, or to be more precise: Hatha yoga, is a perfect solution for dealing with these office-based stressors on the body. Here are four reasons why. This one comes as no surprise. After all, all those crazy stretches and poses are what we immediately think of when it comes to yoga. And indeed, going through regular yoga sessions will improve your flexibility. And, by reducing tightness in your hamstrings and shoulders, it will improve your posture as well. For some of the best yoga stretches to improve your flexibility, check out this article. According to a 2015 study in The Journal of Evidence Based Medicine and Healthcare, practising yoga resulted in a significant reduction in the test subjects’ Hamilton Anxiety Rating Scale (HAR). This was in addition to lowering blood pressure, BMI, and pulse and respiration rates. The HAR measures things like feelings of anxiety, insomnia, fears, depression, and a number of physical manifestations of poor mental health. A strong immune system is vital for office workers. Sharing an enclosed space with others permits the easy transmission of germs. Yoga helps boost the immune system by helping our lymphatic system. The lymphatic system is where our cells dump waste and toxins. Sometimes, that system gets clogged up and as a result, those toxins and pathogens stay in our bodies and wreak havoc. This system basically relies on muscle contractions to operate (both the lymph channel walls and the large muscles in our bodies). Because yoga is a whole-body exercise, it can be particularly effective in increasing the flow of lymph. According to a study from the University of Illinois, even a short 20 minute session of yoga might improve focus and your ability to process information. If your mind tends to wander in the afternoons, consider doing some yoga at lunch. This will let you be more productive for the rest of the day. 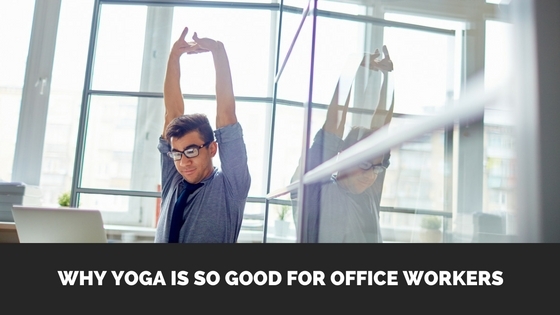 If you work in an office environment, I highly suggest adding a bit of yoga into your life. It’s a low-impact, effective way in general to get exercise, and the direct benefits to your work in the office makes yoga a real winner! Fill out the form to get all the details on the next round of the 3-Week Yoga Retreat. Learn yoga in 21 days. Perfect for beginners! Success! Now check your email for all the details.